EXPLANATION There are unhappily many Christians, who, as St. Paul complains, are, declared enemies of Christ's cross, who do not wish to mortify their senses, who only think of gratifying their lusts, and, as it were, find their only pleasure, even seek their honor, in despising the followers of Jesus and His saints on the narrow path of the cross, of mortification and humiliation. What will be the end of these people? Eternal perdition! For he who does not crucify the flesh, does not belong to Christ. (Gal. V. 24.) He who does not bear the-marks of the mortification of Jesus in his body, in him the life of Christ shall not be manifested. (II Cor. IV. 10.) He who does not walk in heaven during his, life-time, that is, who does not direct his thoughts and desires heavenward, and despise the world and its vanities, will not find admission there after his death. GOSPEL (Matt. IX. 18-26.) At that time, As Jesus was speaking to the multitudes, behold, a certain ruler came up, and adored him, saying: Lord , my daughter is even now dead: but come, lay thy hand upon her, and she shall live. And Jesus, rising up, followed him, with his disciples. And behold, a woman, who was troubled with an 'issue of blood twelve years, came behind him, and touched the hem of his garment. 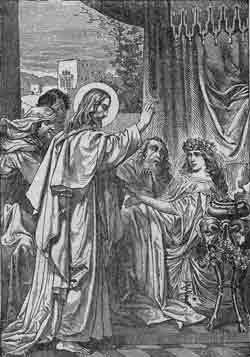 For she said within herself: If I shall touch only his garment, I shall be healed. But Jesus turning and seeing her, said: Be of good heart, daughter: thy faith hath made thee whole. And the woman was made whole from that hour. And when Jesus was come into the house of the ruler, and saw the. minstrels and the multitude making a tumult, he said: Give place: for the girl is not dead, but sleepeth. And they laughed him to scorn. And when the multitude was put forth, he went in, and took her by the hand. And the maid arose. And the fame hereof went abroad into all that country. INSTRUCTIONS I. Filial was the faith, unbounded the confidence, profound the humility of this woman, and therefore, she received health also. Learn from this, how pleasing to the Lord is faith, confidence and humility; let your prayer always be penetrated by these three virtues, and you will receive whatever you ask. III. Jesus called three dead persons to life, the twelve year old daughter of Jairus, ruler of the synagogue, of whom there is mention made in this gospel, the young man at Naim, (Luke VII. 14.) and Lazarus. (John. XI- 43.) By these three dead persons three classes of sinners may be understood: the maiden signifies those who sin in their youth through weakness and frailty, but touched by the grace of God, perceive their fall and easily rise again through penance; by the young man at Naim those are to be understood who sin repeatedly and in public, these require greater grace, more labor and severer penance; by Lazarus, the public and obdurate habitual sinners are to be understood who can be raised to spiritual life only by extraordinary graces and severe public penance. I know, my most amiable Jesus, that the servant cannot be more than his master. Since Thou wert so often sneered at, mocked and blasphemed, why should I wonder if I am derided for my faith in Thee and Thy Church, and for the practice of virtue!